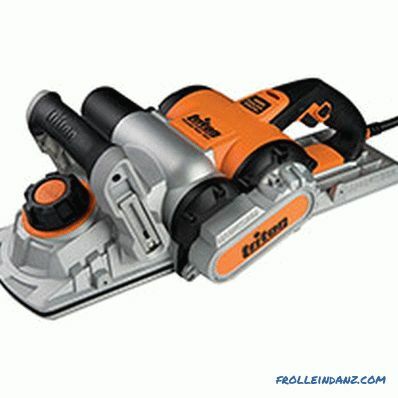 Those who come to this conclusion always have the task: how to choose electric planers. Given the huge number of models on sale today, this is very difficult to do. Amateur or professional, powerful and heavy or small and light, with the presence or absence of a particular function, expensive or not very ?. . In order for the new tool to perfectly meet your expectations from it, you should figure out: what can we expect from modern electric planes in general? With the advent of the electric motor, the plane became more efficient in operation and easier to use, but its design remained generally as simple as that of its progenitor, the eponymous hand tool. The engine and the electroplane drum are placed perpendicular to the direction of movement of the tool. Between themselves, they are connected by means of a driving belt hidden behind a side removable casing. The lower part of the drum, on which the blades are fixed, and which performs the function of the cutting element, is flush with the plane of the rear part of the supporting platform, called the planer base. The front part of the sole is raised relative to the rear to a predetermined height and, in the process of work, relies on still-planed wood. 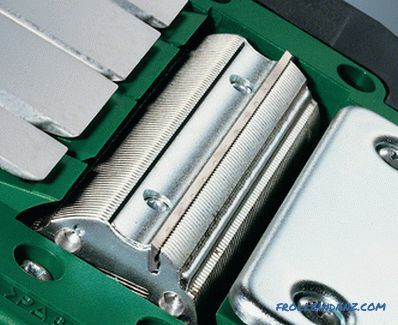 The rapidly rotating drum cuts material off with its blades, as a result, the lower back of the sole slides over the already treated surface. Let us consider in a little more detail the individual structural elements of the electric plane. 1 . Bag for collecting chips. 2 . Nozzle for shavings. 4 . Off button lock. 5 . Trigger for on / off. 7 . The block with the engine. 9 . Regulator of depth of planing. The lower working surface of the electroplane — the sole — consists of two parts, between which there is a rotating drum with knives fixed on it. The displacement of the movable "toe" of the sole relative to the fixed "heel" in the vertical direction sets the depth of the cut. It depends on the quality of the sole how much you will be satisfied with your new tool and the quality of its work. What to look for? First, the material from which the sole is made. In the overwhelming majority of electric planes, this is aluminum, but aluminum can be cast or stamped. 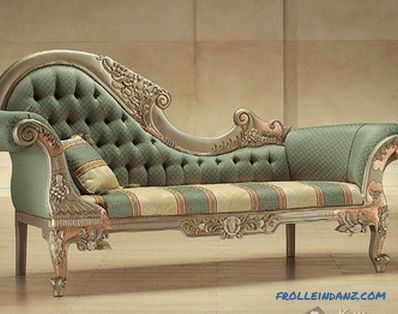 The first option, of course, is preferable, since the cast metal has better strength characteristics than stamped. However, if you select a tool for domestic use, you should not neglect the stamping planes, because they also have their undeniable advantage - a lower price. Secondly, on the quality of polishing the surface of the sole. The latter is smoother, the easier the plane will slide on the workpiece. Sometimes to improve the slip on the surface of the sole is applied a special coating based on polytetrafluoroethylene. Thirdly, on the dimensions of the sole. 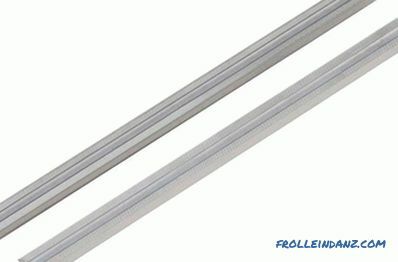 The sole length (for conventional electric planes, it can vary from 300 to 400 mm, and for electrofanes, to reach 500 mm or more) determines the longitudinal stability of the tool. And, finally, the last characteristic on our list (but not the least important one) is the characteristic of the sole to which attention should be paid - its general geometry. No transverse and vertical distortions should be observed, i.e., when the toe and heel of the planing are set to zero, the soles should form an ideal, without gaps, plane. And the line formed by their side edges, ideally, should be flat, which is easy to check directly in the store, attaching a ruler to them. On the sole, as a rule, there is a shallow longitudinal V-shaped groove (sometimes not one, but two or even three grooves of different sizes). Its main purpose is to facilitate the chamfering process. 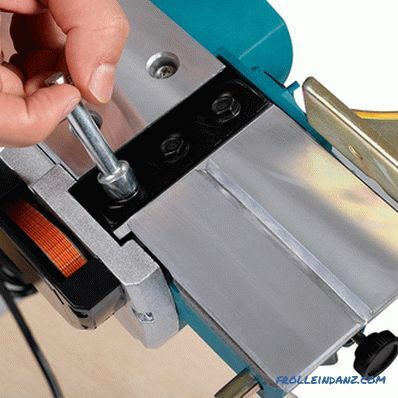 The main working element of the electroplane is the knife drum located in the direction transverse to the movement of the tool between the two parts of its sole.It is attached to the blade, which remove the chips from the treated wooden surface. The number of knives can vary from one to three, depending on the model of the electroplane. Three is found relatively infrequently - mainly on professional tools. The most common and sought after models with two knives. From this one should not conclude that single-blade planes are bad and nowhere to be used. 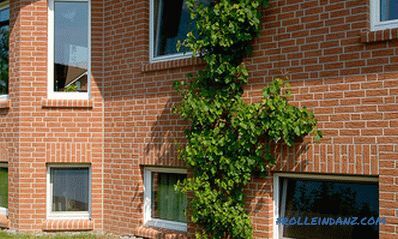 In fact, this is the most acceptable option for those who are puzzled by the question of which electric planer to choose for the house. Such models have their own advantages - a small load on the engine and, as a result, a small mass and low cost. Many planer models support quarter sampling. To do this, one end of the drum is made open, which allows you to choose a quarter along the entire length of the workpiece. 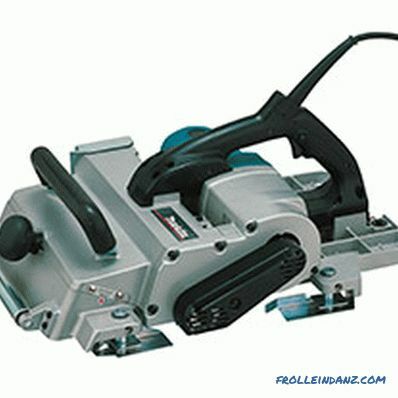 The quarter width is set using a special stop, which comes complete with an electric planer. To change the depth of the sampling quarter, use the planing depth adjustment. To protect the open end of the drum, a protective swivel casing is used. A few words should also be said about the material from which the knives are made. Today on the market there are two types of knives for electroplanes - carbide and high-speed steel. The first ones have a fairly long working life, but when the cutting edge is still blunt, the blade will have to be replaced, but it costs quite a lot. Such knives can be recommended to those who use the plane only occasionally - installed a new blade and you can not remember it for several months or even years. The same masters, for whom the electric planer is the number one tool, will be more suitable for high-speed steel knives, which get blunt quickly but need to be sharpened. This task, however, is not easy, but taking into account the fact that such blades are quite inexpensive, the question is legitimate: is it worth sharpening them at all or is it easier to replace them with new ones as necessary. All technical specifications of the electrical chopper can be found in the documentation for the tool. But finding them is not difficult, but in order to understand what these or other numbers mean, you must first get at least general ideas about all these parameters. Planing Depth is a parameter that indicates how thick a material a planer can take in a single pass. It is determined by the vertical displacement of the "toe" of the sole relative to the "heel" and is regulated by a screw mechanism. 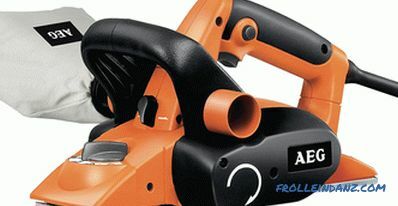 For simple electric planers intended for household use, this value can vary from 0 to 2 mm, while professional models can remove up to 4 mm of wood in a pass. The step of adjusting the depth of planing is usually in the range 0. 1-0. 5 mm. The quality of work done with a finely adjustable planer is, of course, higher, but such tools are significantly more expensive. 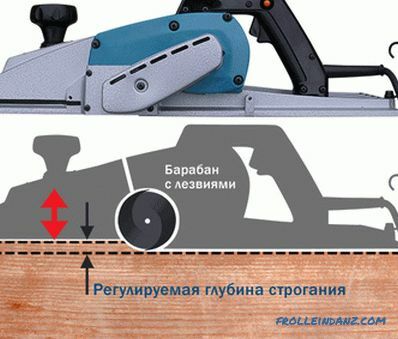 Planing width is a parameter that determines the maximum width of the "track" that the plane makes in one pass and directly depends on the size of the cutting edge of the knife . Pay attention to this characteristic should be, if using the purchased tool is supposed to handle wide boards, timber, etc. Of course, nothing prevents to make two parallel passes, but when it comes to large amounts of work, it is irrational in terms of time costs. 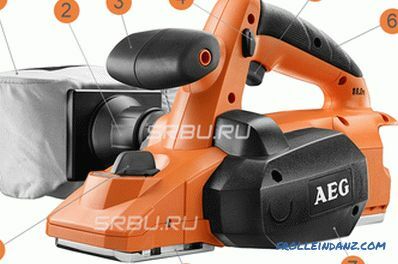 Small household planers, as a rule, have a maximum planing width of 82 mm . For more serious professional models, this figure rises to 100-110 mm . More powerful units that can process 200-300, and some even 350 mm of the surface . Power is the main characteristic of the electroplane (as, indeed, any other power tool), which determines its performance. Power is directly related to the two parameters discussed above: the wider and / or deeper the layer of material is to remove the plane in one pass, the more powerful the engine must have. The capacity and the ability of the planer to process solid wood depends on the power: not every tool that easily copes with, for example, pine or aspen, will be tough with oak or maple. Professional models of electric planes are equipped with 1500-2200 W engines (in this case we are talking about power consumption), 500-900 W are quite enough for domestic ones. Speed ​​is a parameter using which you can evaluate how quickly and efficiently the plane can cope with the task set for it.The angular speed of rotation of the drum in most models of electric planes lies in the range of 10,000-17,000 rpm. / min Models with a low frequency of rotation of the shaft are designed for rough processing of solid wood. It should be noted that at low speeds the vibration of the instrument begins to be clearly felt. Recently, there has been a clear tendency to an increase in the share of wireless construction equipment. And if earlier these were rather “weak” tools, which were resorted to only when you need to perform work in conditions of high humidity or at a considerable distance from the access point to the power grid, then today the battery models are not inferior in many respects (or almost do not yield) to their wired counterparts. 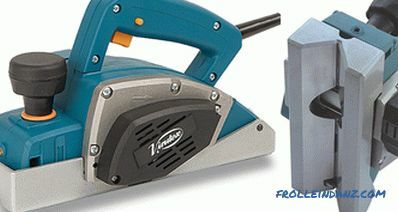 Practically every electric planer manufacturer has its own range of wireless models. The battery voltage for most of these tools is 18 V, a bit less often you can find models with a voltage of 14. 4 V.
In addition to obvious advantages, there are, of course, wireless electrical devices and a disadvantage - high cost. But here you decide whether to overpay for the convenience of work. Obviously one thing, it is advisable to buy such a tool in the case when it is supposed to be used where there is no possibility to connect to the electrical network. In all other cases, it is better to give preference to a network device. 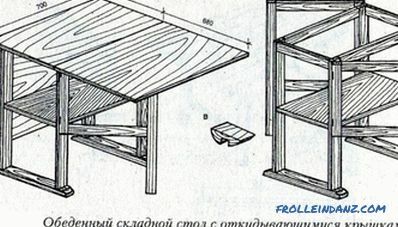 Other structural elements and additional useful functions. The main requirement for the electroplaning handle (as, indeed, any other hand-held power tool ) - ergonomics. From this depends largely on how convenient it will be to use it. Therefore, before buying, be sure to hold the plane you like in your hands. Ideally, the grip should have a rubberized grip or any other non-slip coating. Manufacturers install an additional handle for the master’s left hand in the front of the body of some electric planers: this is a very useful element, since it allows you to evenly distribute the force during operation. 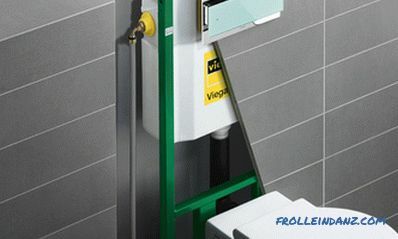 The nozzle, located on the side of the electroplaning body, is intended for the removal of chips and wood dust from the working area. Connecting to it a specially designed bag or hose of a construction vacuum cleaner will allow you to keep the workshop in order and reduce the time for its cleaning. Rarely, but still there are planes with two mirrored nozzles. Such models should be of particular interest to left-handers who find it inconvenient to work when the bag for collecting chips is connected to a standard outlet. In order to increase safety when handling power tools, most models manufactured today are equipped with a button to prevent accidental switching on. 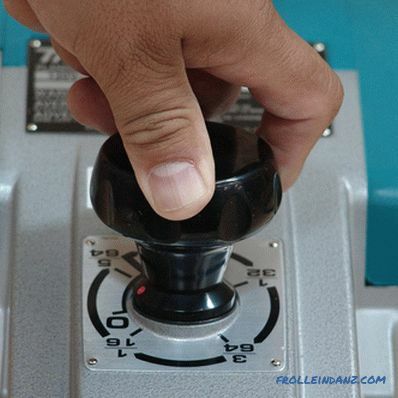 Without pressing this additional button, it will not be possible to press the engine start button, which means that you can safely transfer the plane that is not disconnected from the power grid, without thinking that you can accidentally hit the start button. In addition, thanks to this feature, your young children will not be able to accidentally or deliberately turn on a potentially dangerous "toy." The planer motor with the soft start function is gaining momentum gradually. This prevents the rapid deterioration of the main components of the tool and makes working with it more secure. This feature is especially useful for heavy and powerful equipment. The presence of the function of electrodynamic braking of the shaft allows you to very quickly stop the rotation of the knife drum. This significantly reduces the risk of damage to the knives when the plane is turned off, when the operator wants to release the tool as soon as possible. Yes, and for the master working with the tool becomes a little safer. An increase in the load on the tool inevitably results in engine braking, i.e., a decrease in the number of revolutions per unit time. 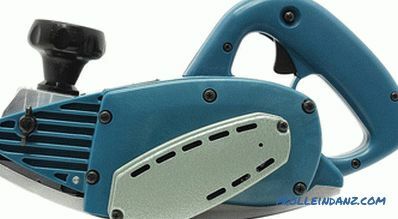 To avoid the risk of jamming of the equipment and to ensure high quality of the surface treatment of the workpiece in these conditions will help constant electronics, maintaining the specified optimal speed of rotation of the blade shaft, regardless of the speed of the plane and the hardness of the wood. Equipped with such a function, as a rule, only expensive professional models. 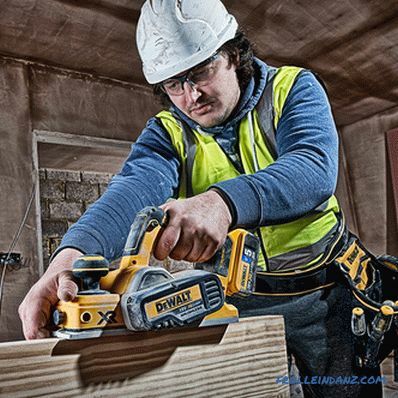 The tasks for carpenters and joiners can be very diverse, and, trying to satisfy all their needs, power tool manufacturers are constantly expanding the functionality of their products. 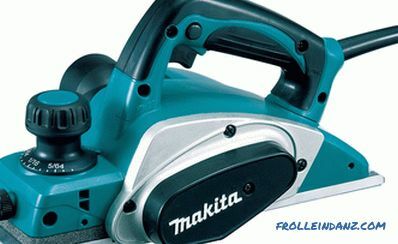 As a result, non-standard, but at the same time popular types of electric planers appear on the market. Some today’s far-reaching models of electric planes are far from stationary: you can move not a plane along a wooden billet, but a billet along a plane — in some cases it is really more convenient. These tools have special tools that allow them to be firmly fixed in an inverted position, and the lock button on the power button. 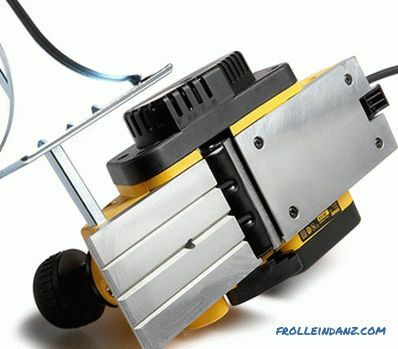 As a result, you get a mini jointing machine. 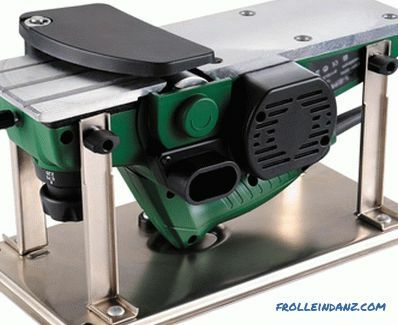 Virtually any modern electric planer is able to chamfer, but, as a rule, it is only a matter of a slight smoothing of the corners of the workpiece. 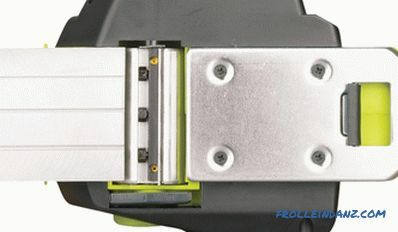 Folding planes are designed specifically for the removal of a full chamfer depth of 25 mm. To do this, in their sole there is a deep V-shaped notch. Infrequently, but there are models in which one spiral-shaped knife is installed on the drum or, alternatively, several straight knives placed at an angle to the axis of rotation of the shaft. Such planes make it possible to achieve a particularly smooth surface. There are commercially available planers specifically designed for machining curved surfaces. This is achieved thanks to the variable geometry of the sole, made of sheet metal. The possibilities of such planes, however, are not unlimited: the radius of curvature of the convex surfaces that they are able to process must be not less than 400 mm, concave - not less than 450 mm. 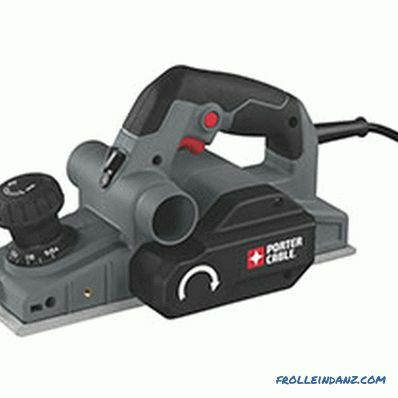 This is not a complete list of highly specialized planers available on the market today, and if you need a tool for performing non-standard work, search and search for it. If you are reading this article, it means that you have not yet decided which electroplane to choose, and a joyful moment of its acquisition for you ahead. However, at this stage it will not be superfluous to become familiar with the basic rules of safety when working with this potentially very dangerous tool. 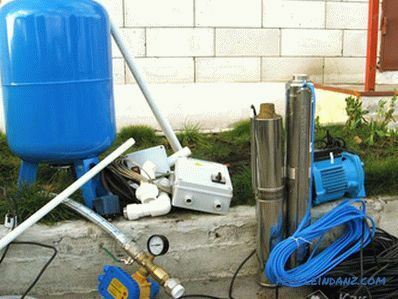 Adjustment and cleaning of the instrument can be carried out only after disconnecting it from the mains. Having a button to prevent accidental activation does not eliminate the need to fulfill this requirement. Carefully approach the issue of choosing working clothes, it is not allowed to have freely hanging sleeves and the floor. Never neglect personal protective equipment such as glasses. Before starting work, carefully inspect the tool for damage to rotating parts and poorly fixed blades. Before planing, all nails and screws, if any, should be removed from the workpiece. 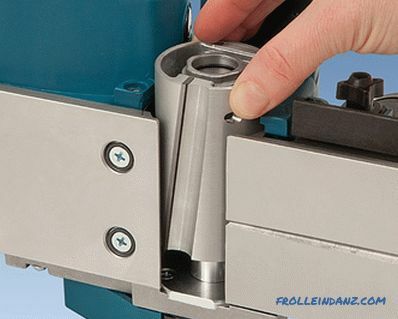 The workpiece must be securely fixed with a vise, clamps, etc. Ensure that you have a comfortable and, most importantly, stable position when working. Use only the blades recommended by the manufacturer. If your electroplane has several knives, they should all be the same (including the same degree of wear), otherwise in the process of work, drum balancing is inevitable and, as a result, strong vibration of the instrument. 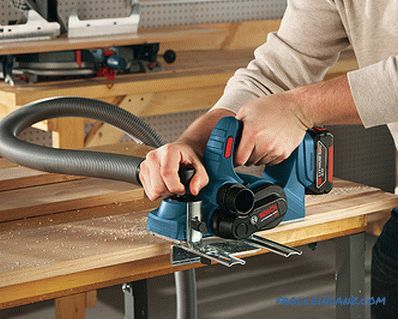 Do not leave the electric planer unattended. Keep it out of the reach of children.